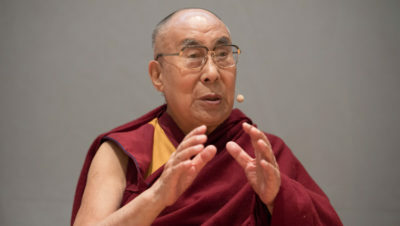 September 24, 2018, Zurich, Switzerland – There was a chill in the air as His Holiness the Dalai Lama left his hotel to drive to Winterthur this morning. When he arrived at the Conference Centre he was received by Jean-Marc Piveteau, President of ZHAW University (Zurich University of Applied Sciences). Once His Holiness had sat down on the stage in the auditorium, Piveteau introduced the occasion. “We’re talking about tolerance, justice and freedom because it’s important to be aware of human values. A university is about more than just earning a degree, it’s about ideas and values and a commitment to responsibility. For us, Your Holiness, you represent many of these values and we’d like to hear from you.’ “Dear brothers and sisters,” His Holiness responded, “when I see a human face, I think, ‘O, another human brother or sister’. We focus too much on secondary differences between us—differences of community, religion, religious denomination, whether people are rich or poor—which gives rise to a sense of ‘us’ and ‘them’. In today’s world, besides natural disasters, many of the problems we face are of our own creation. As a result, people are not very happy. “In the past, the human population was small, and people depended on each other in small communities. Now the population has increased and we make distinctions between this community and that, this country and another. In the 20th century there were two world wars; why? Nowadays, in the Middle East religion has become a cause for people to kill each other. They think in terms of ‘my religion’ and ‘their religion’. Since we create these conflicts, it’s our responsibility to resolve them. “There are signs of hope; the latter part of the 20th century was different from the earlier years. I’m a great admirer of the spirit of the European Union and the way de Gaulle and Adenauer, after being enemies for long, decided it was better to live together and pursue a common interest. The British seem to be leaving for narrow-minded, selfish reasons. “There are differences between us, but at a deeper level we are the same in being human. We’re all born the same way and we die the same way. Some scientists say, as a result of their findings with young, pre-verbal infants that basic human nature is compassionate. At the same time, while constant anger, fear and hatred undermine our immune systems, peace of mind is good for our health. “As human beings we are social animals. We survive in dependence on our community. In Barcelona, I met a Catholic monk who had been living as a hermit in the mountain mediating on love. He lived on bread and tea and was truly happy, but even he depended on the support of the local community. “We need friends and friendship is based on trust. To earn trust, money and power aren’t enough; you have to show some concern for others. You can’t buy trust in the supermarket. In ancient times, you Swiss and we Tibetans may have been satisfied behind our mountains, but today human beings belong to one human community. Therefore, we have to integrate and since we are interdependent we have to show some global responsibility. “If they believe we were all made by God, or if they simply believe in karma, that positive action give rise to happiness and harmful behaviour leads to sorrow, how can people kill each other? We need to think about peace of mind. About 200 years ago the church looked after inner values along with education. Today, inner values need to be incorporated into education, not on the basis of this religion or that, but from a secular point of view. The room was filled with warm applause. Moderator of the panel discussion, Swiss TV anchor Susanne Wille introduced the members of the panel: Dr. Christiane Hohenstein, Professor of Inter-Culturalism and Linguistics; Dr. Andreas Gerber-Grote, Professor of Public Health and Head of Research; Leanardo Huber, President of the Students’ Association; and Dr. Rudolf Högger, Tibet-Institute Rikon. She started the discussions by asking His Holiness if it was true that he was a lazy student. He replied that it was only natural. In Tibet education begins with memorization and at the age of seven he began to learn classical texts by heart and didn’t enjoy it very much. It wasn’t until he was older that he began to take an interest in what he was learning. When he was 16, he told her, he lost his freedom and when he was 24 he lost his country, but by that time he had discovered that what he’d learned before helped him keep his inner strength. The panel discussion touched on self-discipline, listening to the other person’s point of view and sustainability. Dr Högger showed a picture of Tibetan monks in their monastery being taught to dissect fish. They took them apart, organ by organ, eventually lifting out the brain and spinal cord. At that point one of the students asked the teacher “Is this where consciousness begins?” She replied that Western science asserts that without such a basis there can be no consciousness. It was a moment when modern science and Buddhist science acknowledged their different approaches. Answering a few questions from the audience, His Holiness suggested that children can be trained with love and affection to learn to manage their emotions. He expressed doubt that artificial intelligence will ever fully replicate the sophistication of the human mind that designed it in the first place. Asked how to find peace of mind, he replied that first you need to value it. You need to understand how emotions like anger and hatred are unhelpful because they disturb it, whereas cultivating their opposite, compassion, strengthens peace of mind. He pointed out that destructive emotions are rooted in a distorted view of reality. He quoted Aaron Beck, an American psychiatrist with long experience working with people troubled by anger, who told him that when people are angry, the object of their anger seems to be completely negative, but this is 90% mental projection. He added that it useful to know that emotions do not belong to the nature of the mind. The mind is clear like water, but also like water it can become clouded by emotions. The natural clarity of the mind was something he stressed. Moderator Susanne Wille asked the panel for one idea they were going to take away from the discussion. Dr Högger mentioned self-responsibility and the need for personal change. For Dr Hohenstein it was the idea of emotional hygiene and not focussing on secondary differences. Dr Gerber-Grote voiced an appreciation for empathy and Leanardo Huber said he was intrigued by the idea of analytical meditation. Jean-Marc Piveteau expressed thanks to His Holiness and the other members of the panel on behalf of ZHAW University. Dr Karma Dolma Lobsang, on behalf of Tibet-Institute Rikon, also expressed gratitude, noting that this was the fourth and last event of the celebrations of the Tibet-Institute’s 50th anniversary. She wished His Holiness a long life, safe travels and told him that these days with him would not be forgotten. Once more, warm applause filled the hall. His Holiness and the panellists were invited to lunch by the University. 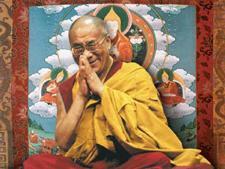 Afterwards His Holiness left for Berne, from where he will fly to India tomorrow.